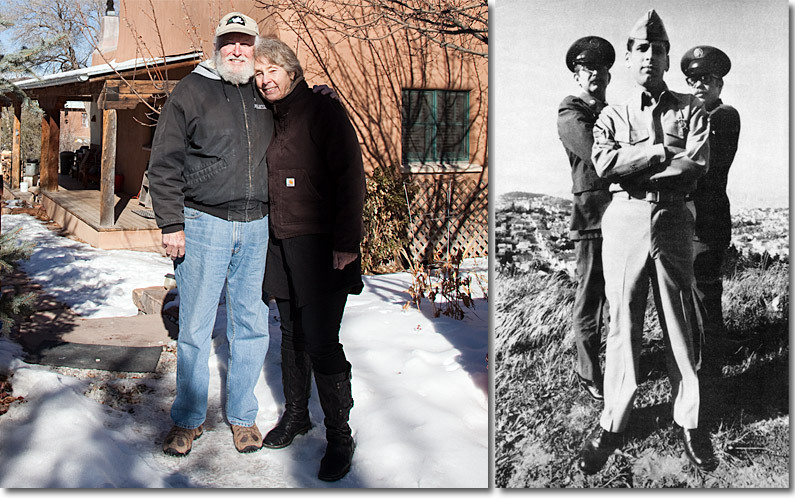 Chuck Williams  "Our Restless Reserves"
Chuck Williams and his wife Lee Lewin outside the home that Williams renovated, Sante Fe, New Mexico, December 2012. Photo by Bill Ganzel. All original material © 2006-2013 by Bill Ganzel, all rights reserved. From the original caption: "Marine Lance Cpl. Steve Pizzo (near right center) and Airmen Chuck Williams (left) and John Bright are reservists with a singular goal. Unlike many of their generation, they don't want to destroy the military. They want to democratize and humanize military institutions." Outside San Francisco, August 1968, photo by Thomas R. Koeniges. By August 1969, LOOK Magazine had become so disillusioned about the Vietnam war that they published a cover story and four additonal articles blasting "American Militarism." The subhead was "Have we created a system that threatens America and all that it stands for?" Veteran war correspondent Eric Severeid wrote the main article. The other articles included a photo essay on basic training for Marines, a civilian massacre in Vietnam, the problems with the draft, and "Our Restless Reserves." In that last article, Chuck Williams Steve Pizzo and John Bright publishing underground newspapers telling GIs how they could resist the military. They formed the "GI Association" in San Francisco to encourage reservists to resist military blunders and arbitrariness. Williams and Bright published the underground paper for Air Force reservists. All three participated in various anit-war demonstrations around the Bay Area. After the military, Williams and his wife Lee Lewin moved to a remote "shack" high in the Colorado Rockies to get away from the drugs and excesses of Berkeley. Williams worked construction and he and Lee raised two kids. But in the late 70s, their house burned. Lee moved to California. A few years later, they reunited and moved to Santa Fe where Williams opened his own construction company. He was successful "building second homes for rich people from Texas," but he stayed active in radical causes. For several years, he volunteered his services to the Sandinistas in Nicaragua for weeks at a time. He was also involved in the independent documentary Sir! No Sir! a film that explored the movement by GIs within the military to end the Vietnam War. Lee established a progressive private school in Santa Fe. Health problems have forced Williams to slow down, but both are still active and committed to each other.